To understand internal constraints and dynamics in Russian climate policy formation as well as conditions for change in Russia's emission trends and international climate position. 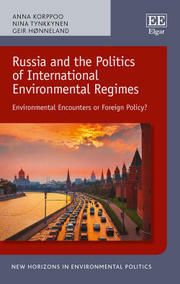 To analyse Russia's influence on the effectiveness of the international climate regime and negotiation process. How has Russia's climate position changed since the ratification of the Kyoto Protocol? Which domestic discourses can be identified on climate policy? Which of these argumentations are reflected in Russia's international climate position? Which domestic pressure groups influence Russia's international climate position, and could thus be considered as 'veto players'? Is there evidence of such two-level game? Which dynamics are likely to influence Russia's greenhouse gas emission trends and how? Which elements of Russia's international climate position are negotiable / non-negotiable and why? Climate Policy, Vol 14, No 2, 2014, pp. 224-241. In Luca Anchesi and Jonathan Symons (eds), Energy Security in the Era of Climate Change. Chippenham & Eastbourne (UK), Palgrave Macmillan, 2012, pp. 143-160.